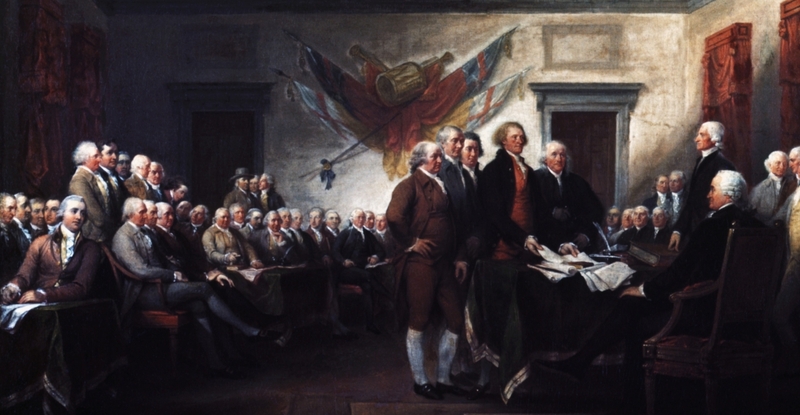 The First Continental Congress did a few things, like draft the Articles of Association 1The Articles of Association were petitions of grievances against Great Britain by the Thirteen Colonies and a compact among them to collectively impose economic sanctions to pressure a resolution. The Articles were drafted by the First Continental Congress in 1774 and were an important formative document in the history of the United States that perhaps hastened the American Revolution, though they were intended instead to alter Britain’s policies towards the colonies without severing allegiance. and to provide for a Second Continental Congress to meet on May 10, 1775, but the big news from the Second Continental Congress was that they began debating a resolution in favor of independence, which was approved on July 2, 1776 and signed 2 days later. Big news indeed. And yeah, you know some of these men, but what about the other men? Here they are, the members of the Second Continental Congress – 2The list of these men can be found pretty much anywhere on the Internet, but my list came from Wikipedia. Share the post "Members of the Second Continental Congress"